Dental implants are changing the way people live and are one of the most important advances in modern dentistry. 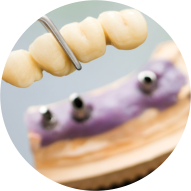 Implant dentistry offers a patient who is missing one, several, or all of their teeth an excellent alternative to partials or complete dentures. Our very own implant dentist in Mission Viejo, Orange County, CA – Dr. Kurt Schneider – provides the comfort, appearance, and function of natural teeth. 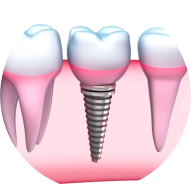 A dental implant is a small titanium cylinder that is surgically placed into the upper or lower jawbone and serves as a root substitute for a tooth. During a four to six month healing period the jawbone fuses to the implant and anchors it in the mouth. These anchors provide a strong foundation for replacing single or multiple teeth. Once appropriate healing time has transpired, Orange County dental implant expert, Dr. Schneider, creates a customized prosthetic tooth for each implant. He then places each prosthetic tooth on each implant restoring tooth function. 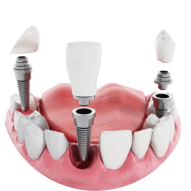 For Dr. Schneider’s Mission Viejo dental implant patients, the placement of the implants most often involves two procedures. First, implants are placed within your jawbone. The implants remain below the surface of your gum for a four to six month healing period and gradually fuse to the jawbone. You can continue to wear your dentures or temporary teeth during this time.After each implant has bonded to the bone or “osseointergrated”, Dr. Schneider performs a minor procedure to uncover the implants. Small posts are attached to the implants. These posts protrude through the gums and will serve as anchors for the replacement of each missing tooth. Orange County dental implant specialist, Dr. Schneider, then adheres a prosthetic tooth to the implant post, restoring the function and appearance, so that your implant teeth function as natural teeth. The entire dental implant process typically takes six to eight months. Most Orange County dental implant patients experience little or no disruptions to everyday life. Every day dental implant patients tell Dr. Schneider about how implants have improved their lives because they can chew with confidence and ease during family dinners, or extend a smile to some one with out worry of slippage. With the best dental implant expert in Orange County Dr. Schneider, dental implant consultations are complimentary. To schedule your one-on-one dental implant consultation with Dr. Schneider, please call our smile care team at (949) 380-0700.